Ocean Creek Resort is a unique 'plantation style' resort within Myrtle Beach. It boasts first class accommodations and amenities in a family friendly environment. You won't find a more beautiful, secure, natural setting within the Grand Strand. Our ''home away from home'' is a well maintained, attractive, very clean 2 bedroom condo centrally located within a 57 acre oceanfront resort community (Ocean Creek Resort). 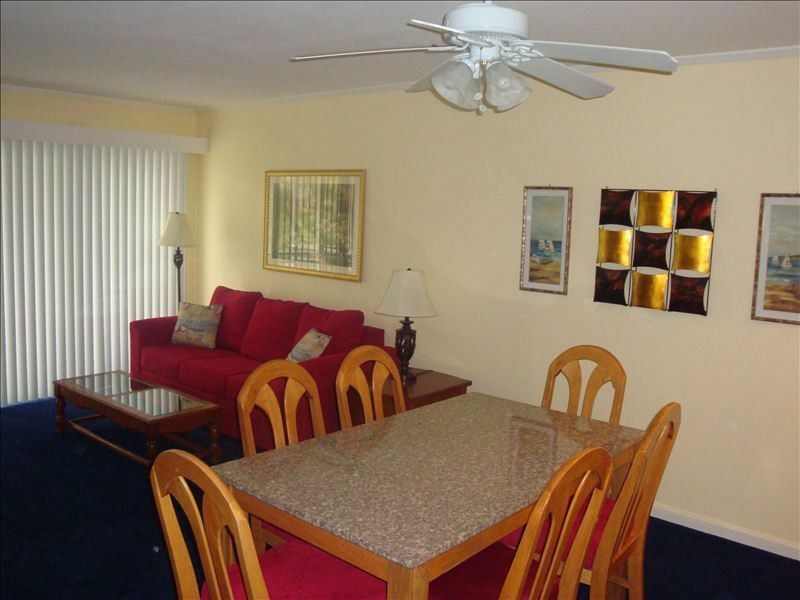 The condo is just a short walk to either the ocean or the Barefoot Landing shopping/entertainment/restaurant complex. It is truly a place where you can relax at the beach, spend time with family, or shop or dine to your heart's content. The gated resort features, 6 outdoor swimming pools, 1 indoor swimming pool with spa/hot tub, a putting green, a tennis complex, and an ocean front beach club. With 24 hour on-site security, you will enjoy knowing that you and your family and guests are safe and secure within the resort grounds. Recreation: The private ocean-front beach club sports an outdoor swimming pool and kiddy pool, beachfront volleyball area, children's playground, and seasonal bar and grill. You could easily spend all day at the club and never tire of it. The tennis center sports clay courts and offers tennis lessons, court times, and occasional tournaments. It's the perfect environment for anyone that enjoys tennis - best in Myrtle Beach! If you love to walk or jog, you will find no finer place. Choose from either the manicured grounds of the resort or the sand beneath your feet on the Atlantic Ocean beach. At the end of your day, reward yourself with a quick swim in the indoor pool followed by relaxing time in the hot tub before sauntering back to the condo. Condo Amenities: Our condo includes 2 balconies: one off the master bedroom with seating for two, and a screened-in balcony off the living room which seats four. Both overlook the landscaped grounds of the resort.The master bedroom features a king size bed; the second bedroom features 2 twin beds. Each bedroom and the living room include cable TV. All beds are supportive and comfortable providing you and your family/friends with a good night's rest. A full bathroom is conveniently located directly off each bedroom. Each bathroom has its own room heater and a hair dryer. Additional sleeping arrangements are provided by the new queen size sleeper sofa in the living room. You will also find a very comfortable rocking chair there. The condo presents as fresh and clean as the kitchen, bathrooms, living room and dining room are freshly painted. The bedrooms have neutral wallpaper. Additional Condo Amenities: The kitchen is well lit and comes with silverware, cooking utensils, dishes, and pots and pans. All appliances are relatively new and are in good working order. The bathrooms and kitchen floors feature new neutral ceramic tile and the bedrooms, living room and dining room are all carpeted. You can enjoy sharing a meal in the dining room at the beautiful granite table. In short, our condo is a very comfortable place to relax and enjoy each other's company either during the day or after a day's worth of activities and sightseeing. We have family in the Myrtle Beach area and purchased this condo so we could stay close to them as our home away from home. We enjoy our visits to the area and hope you will too. We chose Myrtle Beach because of the family ties and for the location and the plantation style feel. It is beautifully landscaped with a tropical feel having all the amenities one could ask for (beach club, beach, playground, multiple pools, tennis complex, etc.). We love that it is in a safe area and a gated community as well. Bathrooms are freshly painted with recent renovations. We are centrally located within an Oceanfront Resort, just a short walk to the beach. Lush 57 acre beachfront resort. Oceanfront beach club w Olympic size pool, volleyball, swings, & grill/snack bar. Resort includes outdoor/indoor pools, tennis complex, miniature golf, & gym. Central AC and heating is available throughout the condo. Linens are provided for the king size bed in the master bedroom, the 2 twin beds in the second bedroom, and the queen size sleeper sofa in the living room. Comfortable towels are provided for your use within the condo unit. Please bring your own towels to use for the beach and pool areas. The living room will seat 4 comfortably (3 in the sleeper soarer) and 1 in the gliding rocking chair. The LR/DR combination will accommodate an additional 6 people around the dining room table. Full size refrigerator/freezer is provided. Full size oven/stove is provided. Dishes and utensils for 6 are provided. The dining room table is granite and accommodates 6 chairs. Cable TV is provided free of charge in the condo. There is a tennis center located within the resort sporting 5 clay courts. Court time is available for an hourly fee and lessons are available as well. Great location, great place, owner involved, everything ready for you. Very clean and comfortable. Will definitely stay here again. Well managed property, very nice condo. We cannot say enough about our stay. Kevin was an exceptional host and catered to our every need. The questions about the items in the condo that normally cause confusion and must be learned (light switches, tv remove operation, coffee pot instructions, etc.) were answered in Kevin's pre-rental letter or labeled at the condo. The rooms were clean and comfortable and the ocean was a short stroll away. Overall, the condo was very nice. Everything we needed was there, plus some. Was a little further to the beach than what we expected, but there are golf carts that can pick you up & take you right to the beach. Would stay here again. I was very impress. I loved it. It was the best place I ever stayed at the beach. I only had one disappointed that was on the website it advertised activities for the kids every day starting June 4 th and when we tried to find the activities the first day we found out they did not start until June the 11tj. The kids was disappointed also because we had already talked with them and had made a schedule of what activities they wanted to do. Other than that it was a great place to stay. I would be very interested in staying at Kevin's place again next year about the same time. Thank you very much Kevin!!! We're so glad you enjoyed your stay at the beach and look forward to having you back again! The resort website (not HomeWay website) advertises the activities and the resort changed the activities dates. Our condo is centrally located within a beautiful plantation style resort situated on a 57 acre beachfront community. The condo itself is within walking distance of Highway 17 and the beach, just across the street from the Barefoot Landing Entertainment Complex. Tanger Outlets is just 2 miles south. We are convenient to all Myrtle Beach attractions. We accept Checks, e-checks, credit cards (MC, Visa, Discover). **** $60 ADDITIONAL CLEANING FEE *** to be left for housekeeper UPON DEPARTURE. Upon departure, trash is to be placed in the outside dumpster. Upon departure, dishes are to be placed in the dishwasher and the dishwasher started. Rates subject to change until reservation confirmed. No Smoking. No Pets. Additional fees incurred for international credit card use will be subtracted from the security deposit refund During peak summer season only weekly stays are booked from Saturday to Saturday. You may want to consider purchasing travel insurance to protect your rental expense in the event of severe inclement weather or illness. Please contact me for Monthly Winter Rates (January, February, March) or multiple week rates.